Russian rabbi and author; died at Karlin, government of Minsk, 1855. He was a grandson of Baruch of Shklov, the mathematician and author, and was one of the earliest and most renowned graduates of the yeshibah of Volozhin. He held the office of rabbi at Karlin for about thirty years, and was considered one of the greatest rabbinical authorities of his time. Jacob was the author of: (1) "Mishkenot Ya'aḳob" (Wilna, 1838), responsa on the four parts of the Shulḥan 'Aruk; (2) "Ḳohelet Ya'aḳob" (ib. 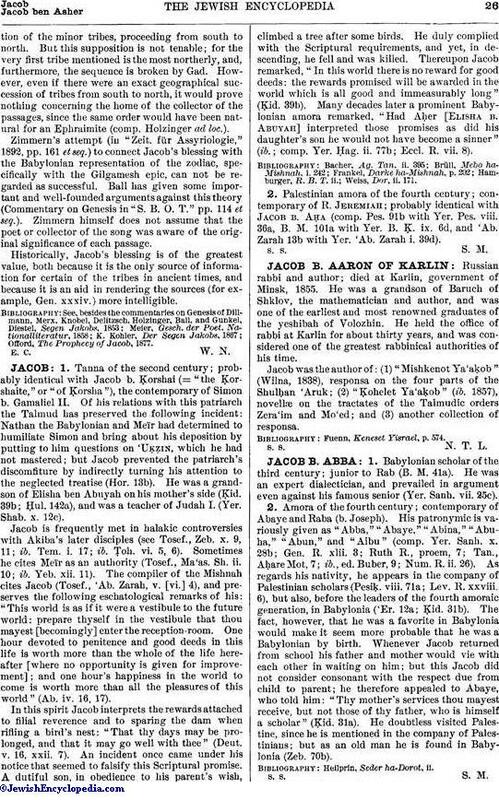 1857), novellæ on the tractates of the Talmudic orders Zera'im and Mo'ed; and (3) another collection of responsa. Fuenn, Keneset Yisrael, p. 574.